It’s never too late to learn how to sail. Whether you sailed as a child or always wish you had, our adult instructional sailing programs can get you out on the water and operating a sailboat with confidence in no time. We offer a variety of boats, instruction levels, and class times to fit your preferences and schedule – no more excuses! 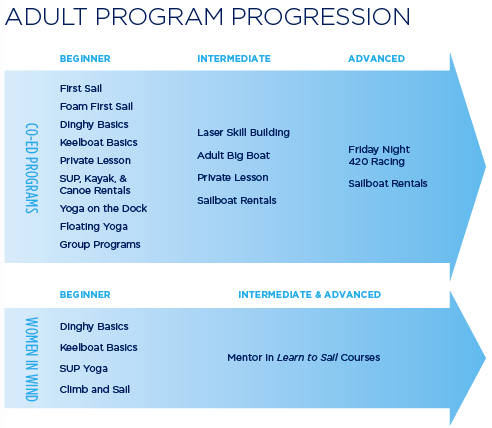 If you aren’t sure if sailing is right for you or if you do not have time for a full course, this is the program that will get you out on the water. In partnership with US Sailing’s First Sail program, we are offering several opportunities throughout the summer for you to have your first sail. Want to try sailing? Love local beer? Come on down to the waterfront every first Saturday of our season for our First Sail program in partnership with our neighbors Foam Brewers. We will sail in the afternoon and walk over to Foam Brewers to enjoy a tasty local post-sail beverage as a crew. Intro to Sailing – New! Brand new to sailing? Then this 2-hour introductory class is for you! Join us for a classroom introduction to the basic concepts of sailing. Learn the basic sailboat parts‚ points of sail‚ basic sail trim‚ some essential knots‚ tacking‚ gybing‚ and more. 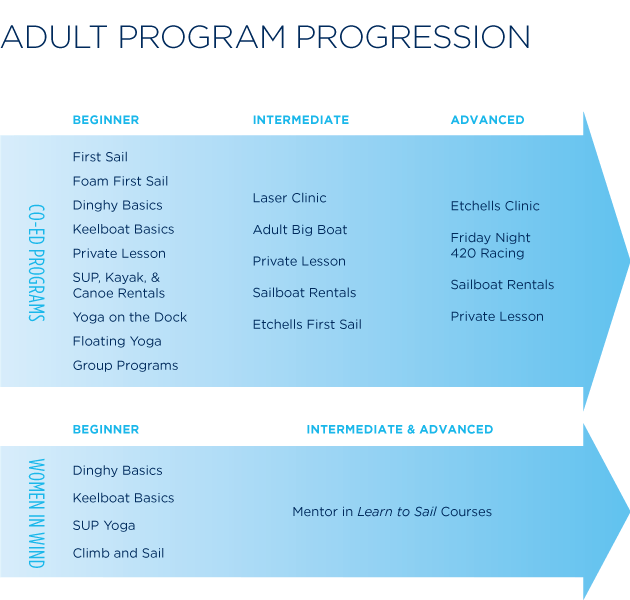 You will also learn about the in-season sailing courses, lessons and rentals available at the Community Sailing Center. Sailing dinghies offers an excellent opportunity to get an active, hands-on introduction to the sport of sailing. These fun vessels seat 2 adults and bring you close to the water, allowing you to feel how the waves and wind affect the boat immediately. If you have never experienced big-boat sailing or enjoy the more relaxed side of the sport, then keelboats are the right boat for you. Unlike the dinghy course you will be in a large boat with several adults and an instructor, all learning how to sail together. Embrace the power of the wind and challenge yourself by sailing in a positive, supportive all-women environment. The CSC is proud to offer the US SAILING Basic Keelboat (BK) Certification. The BK Certification course covers basic and advanced sailing techniques, including reefing and anchoring. This is a one-day course for our graduates of the 15-hour Sailing Basics Keelboat Course. This 3-hour skill-building sailing class will help you become a better Laser sailor by fine-tuning your existing sailing skills. Instruction will focus on boat set up, boat handling, and sail trim to maximize your boat speed in a Laser. This is a fantastic opportunity for adults who are looking to expand their knowledge of sailing. This full-day sailing clinic will introduce the basics of sailing bigger boats, including the crew roles and skipper responsibilities that go beyond those needed to sail small boats. Etchells Sailing Clinic – New! Come learn the ropes of the CSCs newest fleet member! This clinic, running over the course of four evenings, will allow advanced sailors to hone their sailing abilities aboard our 30” Etchells. Adults interested in developing advanced sailing techniques and keelboat racing basics look no further are encouraged to join. Tuesday Night Etchells First Sail – New! Are you ready for a new set of challenges aboard a new vessel? This First Sail will give students the chance to dip their toes into the world of Etchells sailing, one of the most popular boating classes on Lake Champlain. Join us for an onboard creative writing experience & let your story flow. In this workshop, we will come together in the dynamic & inspired waters of Lake Champlain to venture out on a voyage of self-discovery. Dry Land Refresher for Returning Keelboat Sailors – New! Shake out those winter cobwebs and review basic theory‚ terms and maneuvers. Rigging‚ docking‚ mooring, and crew-overboard drills are also covered with chalk talks. This class is a great way for returning keelboat sailors to prepare for the upcoming 2019 sailing season! Dry Land Refresher for Returning Dinghy Sailors – New! Shake out those winter cobwebs and review basic theory‚ terms and maneuvers. Rigging (including adjustments for lighter and heavier winds)‚ launching and returning are also covered with chalk talks. This class is a great way for returning dinghy sailors to prepare for the upcoming 2019 sailing season! Forest Bathing Walk and Paddle Adventure – New! Unplug from your life and join us for a tranquil paddle on the lake followed by a Forest Bathing Session. Led by Certified Nature & Forest Therapy Guide Duncan Murdoch, this session will offer ways to explore nature through your traditional 5 senses in new and deeply familiar ways. The session will culminate with a tea ceremony in the forest and return paddle back to the CSC. Tactics, Tips & Go Fast Topics with Bill Gladstone – One Night Only! Join us for a 2-hr Evening Seminar presented by North U’s Bill Gladstone. The seminar is a quick tour of some of our favorite tactics and boat speed topics. We won’t cover everything in just two hours. We’ll be focused on real world scenarios and lessons we’ve learned in recent races. Racing allows seasoned sailors to experience the thrill of competition.